This Canadian Rockies & Glacier National Park tour delivers the pristine wilderness of several national parks and the soaring beauty of the Rockies on both sides of the Canada/U.S. border. In Canada, travel to Waterton Lakes National Park, an UNESCO World Heritage Site with rugged mountains and beautiful water. Visit the historic mining town of Fort Steele; Kootenay National Park; and Head-Smashed-In Buffalo Jump, another UNESCO World Heritage Site with one of the world’s oldest and best-preserved buffalo jumps. 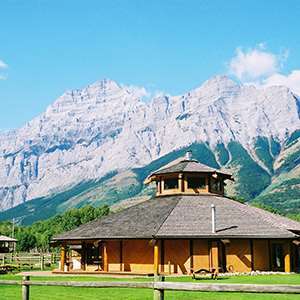 Also in Canada, stay two nights in both Banff and Jasper National Parks. 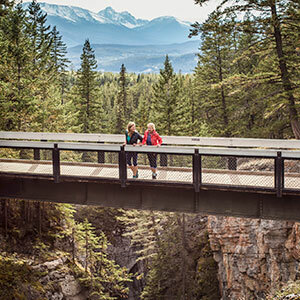 In Banff, enjoy leisure time to explore on your own. As you head to Jasper National Park, stop for a memorable ride aboard an Ice Explorer at the 750-foot-thick Columbia Icefield. In Jasper National Park, journey to Maligne Lake, the largest glacially formed lake in the Canadian Rockies, and take a cruise to Spirit Island. Also visit gorgeous Lake Louise, another highlight of your vacation. In Montana, visit stunning Glacier National Park, where you’ll enjoy a thrilling drive on the spectacular Going-to-the-Sun Road aboard a famous, vintage red “Jammer" bus. The Going-to-the-Sun Road is one of North America’s most spectacular drives. It crosses 6,664-foot-high Logan Pass and offers alpine scenery where jagged mountain peaks, deep green forests, pristine lakes, and meadows dominate the landscape. A breathtaking experience indeed! 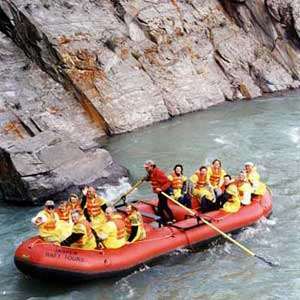 On this Canadian Rockies & Glacier National Park tour, Globus has also arranged special experiences for you. In Glacier National Park, enjoy a made-from-scratch piece of huckleberry pie or ice cream. Or how about entertainment by a local cowboy poet in Calgary? The region’s Western heritage will come alive through the cowboy poet’s stories and songs. From the stunning scenery to the fun experiences, this vacation is sure to delight! Welcome to Calgary! At 6 pm, meet your traveling companions for a welcome drink. Your Tour Director will prepare you for your upcoming adventure. Before departing Calgary, enjoy an orientation tour of the city’s highlights. Travel south along the Macleod Trail. Just outside the town of Fort Macleod, visit HEAD-SMASHED-IN BUFFALO JUMP, a UNESCO World Heritage Site. Then, on to scenic WATERTON LAKES NATIONAL PARK with a photo stop at Cameron Falls. Enter Montana through Waterton-Glacier International Peace Park, a UNESCO World Heritage Site, and behold the awesome snowcapped peaks of GLACIER NATIONAL PARK. A highlight awaits you as you board the famous vintage red “JAMMER BUSES” that will take you along one of North America’s most spectacular highways: Going-to-the-Sun Road. After crossing 6,664-foot-high Logan Pass, enter a geographical wonderland of alpine scenery where jagged mountain peaks, pristine lakes, and meadows dominate the landscape. Before arriving at your resort, enjoy a made-from-scratch piece of HUCKLEBERRY PIE or ICE CREAM—a delicious treat to end your day. The visit to Logan Pass is normally possible from mid-June to mid-September. If unable to travel to Logan Pass, alternative sightseeing by Red Jammer bus will be done. Re-enter Canada today, with a stop in British Columbia before crossing into Alberta. Visit the restored town of FORT STEELE, where fortunes were made during the Kootenay Gold Rush. Next, drive through the steep red cliffs of Sinclair Canyon and KOOTENAY NATIONAL PARK before entering BANFF NATIONAL PARK, the heart of the Canadian Rockies. This morning, sightseeing includes a stop at beautiful Bow Falls. 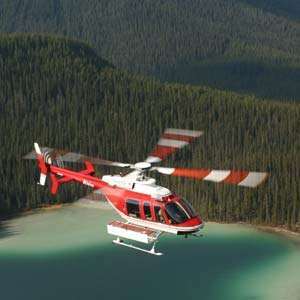 The balance of the day is at leisure, or maybe join an optional helicopter flightseeing trip for unsurpassed views of the Rockies. Follow breathtaking Icefields Parkway today and head for JASPER NATIONAL PARK. Scale Bow Pass for splendid views of Peyto Lake. Then, climb to Sunwapta Pass to savor stunning vistas of alpine meadows, waterfalls, and glacier masses. Next is the highlight of the day: stop at the 750-foot-thick Columbia Icefield for a memorable ride aboard an ICE EXPLORER. There’s time this afternoon for an optional float trip down the historic Athabasca River. The morning is at leisure. Optional activities include hiking, canoeing, and strolling the streets of Jasper. 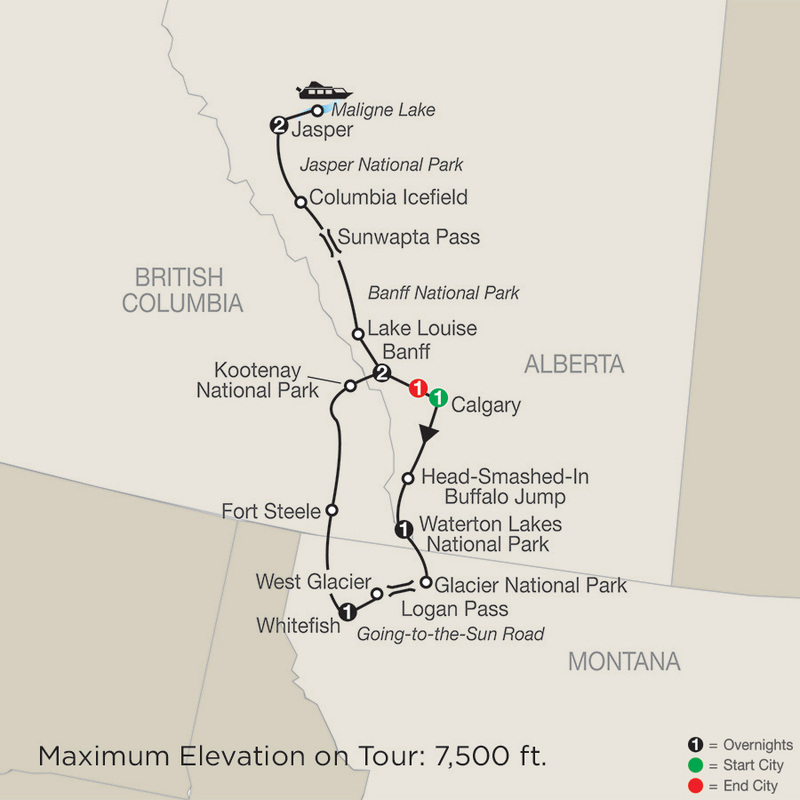 This afternoon, journey to Maligne Lake for a fully narrated CRUISE of the glacial lake and Spirit Island. Afterward, enjoy a lakeside dinner with incredible views and local fare including famous Alberta beef. This morning, visit Athabasca Falls and then retrace the route south along Icefields Parkway. 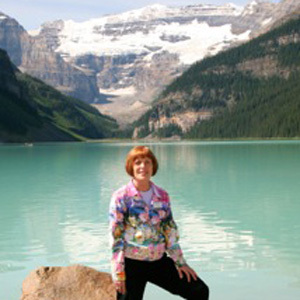 One more highlight saved for the last day of your vacation: a visit to famous LAKE LOUISE. Continue to Calgary, where your Tour Director hosts a special farewell dinner. Over dessert, be entertained by a local COWBOY POET who will bring the region’s Western heritage to life through stories and songs—a perfect ending to your vacation. The tour ends after breakfast this morning with guests departing on individual schedules. Join your group for a fun filled dinnertime experience. A horse drawn wagon ride will take the group on the scenic trails surrounding Boundary Ranch with a stop for viewing at the Buffalo Paddock. Upon returning to the ranch you will enjoy a BBQ Steak dinner.